Anales Soc. Ci. Argent. xcix. 137 (1925). Altitude: 10-450 metres above sea level. 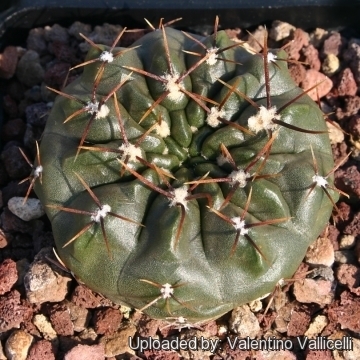 Description: Gymnocalycium gibbosum var. 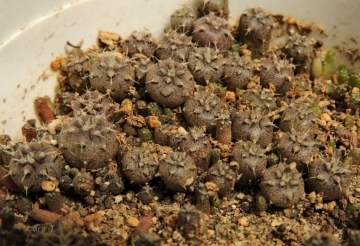 chubutense is one of the several forms of the very variable Gymnocalycium gibbosum which form a complex of related taxon. It is still unclear whether this variable complex is one or several species. There is so much variation that most authors choose to lump them together. The variety "chubutense" distingushes for the unusual dark green to nearly black stem and for the cream-white or pinkish flowers. Stem: Flattened-globose to elongate, grey-green, purplish-brown to nearly black up to 9 cm in diameter and 10 cm height. Ribs: 9 to 16 vertical with rounded or rarely square chin like projections. Tubercles about 8 mm high, 15 mm wide. Areoles: slightly recessed, about 20 mm apart, oval, up to 5 mm long and up to 3 mm wide, covered with yellowish-grey felt. 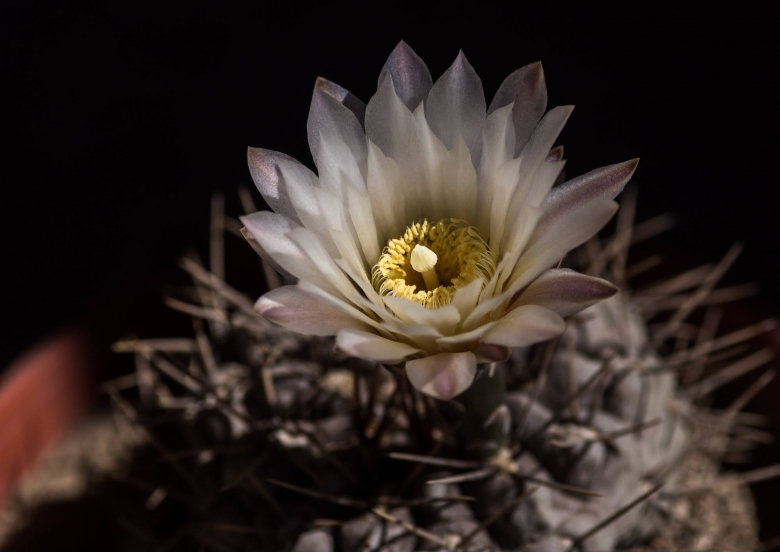 Radial spines: Usually 5 (but occasionally up to 9) flexible to stiff, straight (rarely twisted or bent), radiating more or less diagonally and up to 5 cm. long. One of them is directed downward, and often longer than the other. 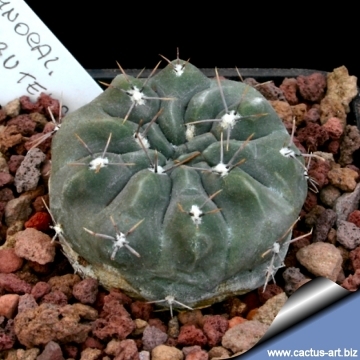 The spines are very variable in colour, whitish, yellowish at the base and dark grey to brown at the apex but turning grey as they age. 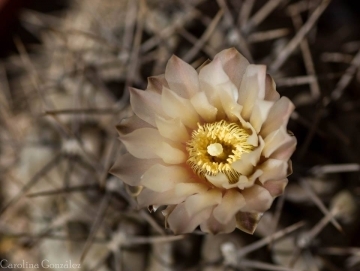 Flower: Funnel-shaped, laterally near the apex, white to pale violet-pink with a pink-coloured throat up to 4,5 cm. long and 5 cm in diameter. Outer tepals to 20 mm long and 5 mm wide, broadly lanceolate, brownish-coloured, inner tepals 26 mm long and 6 mm wide, lanceolate, sharp-pointed white to bright white, all pink-based. Floral tube dark grey-green to violet brown, covered with numerous small, widely rounded scales. Filament whitish to yellowish, anthers yellow, oval. Pistil (without stigmas) about 12 mm long greenish-yellowish above, with 10 to 13 pale yellow stigma lobes. Nectar chamber widely funnel-shaped, yellowish-pink. Fruit: Spindle-shaped to barrel-shaped, bluish to whitish (resembles the plant body, but considerably darker) up to 1,5 cm in diameter. Dehiscing on the side lengthwise, pulp is whitish and rather dry. Seeds: 0,9 to 1,1 mm long and equally broad, ovate, black. Propagation: Seeds (It don't produces offsets). Seeds germinate in 7-14 days at 21-27° C in spring, remove gradually the glass cover as soon the plants will be well rooted (ca 1-2 weeks) and keep ventilated, no full sun for young plants!